1958: Palo Alto. Claude Oakland designs while he was working for Anshen and Allen. 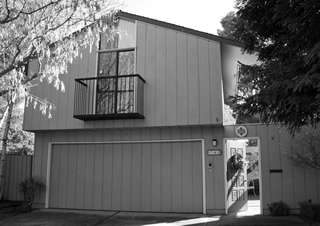 Inspired his Los Arboles Eichler designs of the early ‘70s. Two houses side by side at the corner of Melville Avenue and Cowper Street. 1959: Terra Linda. A bit of a mystery, against a hillside and away from other Eichler homes, this house (the Bloyd-Smetana home in our story) was a one-off experiment that likely originated from Anshen and Allen’s office. 727 Butternut Drive. 1960-‘62: San Mateo Highlands. Ambitious project of up to 99 homes with architect Aaron Green planned for the hills at Laurel Hill Drive. Two two-story models (‘Arrow’ and ‘Semicircle’) were designed, but the project was abandoned. 1961: San Mateo Highlands. 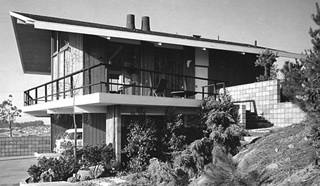 In the midst of the Aaron Green project above, Eichler managed to put up three other models side by side on the same slope, on Laurel Hill Court. Likely Jones & Emmons. 1962: Terra Linda. Twelve two-story homes (including the Everingham and Maginnis homes profiled here) on Beechnut Court and adjacent Las Ovejas Avenue. One model (eight of U-34) by Claude Oakland, the other (four of DA-14) presumably by Jones & Emmons. 1965: San Mateo Highlands. 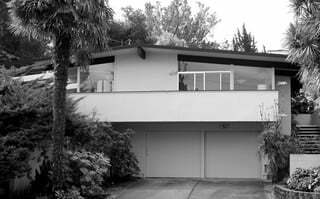 Along the same sloping Yorktown Road strip as the ‘Life house,’ Eichler returned with Claude Oakland for six two-story homes (including the Crosby home) using three different designs, including the unusual SM-3 with its dramatic chalet-like roofline, and the boxy SM-4 like Crosby’s. 1965: Mill Valley. For his Harbor Point project, Eichler originally planned 99 homes with spectacular bay views, but insolvency stopped building at 15 houses, all on Starboard Court and adjacent Great Circle Drive. (Includes the Toole and Miller homes). 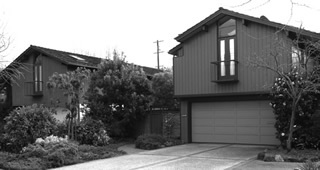 Four homes were two-stories: HPO-43 and 23 by Claude Oakland, and HPJ-3 and 5 by Jones & Emmons. 1967: Sleepy Hollow. An Eichler custom, by Jones & Emmons, built on a hillside lot owned by the Jacks family, original owners who moved there from Eichler’s Laguna Heights co-op development in San Francisco. 540 Fawn Drive. 1969: Sunnyvale. A site plan, and perhaps more, was created by Claude Oakland’s office for a strip of single- and two-story houses on Lennox Way, near Eichler’s Primewood development. Project was never built. 1974: Palo Alto. Some of the last Eichlers built before Joe’s death, Los Arboles Addition, a mix of single- and two-story homes on Torreya Court and adjacent Loma Verde Avenue, features nine two-story homes (including the Fialer home) based on Claude Oakland’s PA-314 and 315 designs.